So, now that I’ve mostly gotten the Avengers out of my system, we get to talk about another 2012 movie I saw: Snow White and the Huntsman. You saw the clips for that? It really is a good movie. I think that one of its biggest appeals is it gives the audience a look at the one character in the Snow White legend that is hardly given a chance to be in the spotlight: the Huntsman (played by Chris Hemsworth and given the name Eric in the film). I knew you were going to say that about Ms. Theron. Do I have to call Gibbs? Good. Don’t do it again. Usually, the Huntsman barely gets five minutes of screen time, and he is depicted as being loyal to the wicked queen until his heart is touched by Snow White’s beauty. After deceiving the queen with a pig’s heart instead of her step-daughter’s, the Huntsman is never heard from again. This movie stands the Huntsman’s role on its head while giving him a wonderful character twist. The Huntsman in this film only agrees to work for the queen, named Ravenna here, when she promises to revive his dead wife. While he seems to doubt her claim, at the same time he appears to decide that if there’s some way to regain his wife he’ll take it. However, prior to and following this agreement with an obvious witch, the Huntsman never shows Ravenna a wit of respect. In fact, he never even seems to fear her in any way. Considering she scares everyone around her, this is amazing. All indications are that the Huntsman is concerned only for himself and what he desires. Why did he choose to protect Snow White if that was the case? He admits why he does this later on, Tony. He stays with her because she reminds him of the wife he loved and lost; the wife he could not protect when she needed him so desperately. So in his own way, the Huntsman is trying to redeem himself, in his own eyes if no one else’s, for the greatest failure of his life. In assuming the position of Snow White’s protector he becomes the antithesis of Ravenna’s brother and enforcer, Finn. This ‘mirrors’ (pun intended) Snow White and Ravenna’s opposing personalities but far more noticeably. You see, Finn has power, wealth, shelter, and the company of women (whether they want it or not). The Huntsman has no money to pay even his drinking debts, no home, and his wife has been murdered – by all indications quite horribly. The weights on the scales of Fate seem to favor Finn, who is determined to kill the Huntsman. In the end, when Finn makes the stupid mistake of gloating about the murder of Eric’s wife, the Huntsman overpowers and kills him while Ravenna, desperate to stay alive, cannot simultaneously heal Finn and save her own life. Guess which choice she makes, Tony! Thus the Huntsman’s love for his dead wife gives him a strength that Finn lacks. Because Finn and his sister share no true filial love, the Huntsman, even with his broken heart, is proved to be a stronger man than the death-dealing enforcer. Pardon? Wait, what do you mean I’ve missed something? Oh, come on, have you been paying ANY attention? 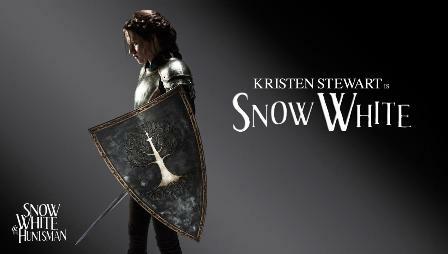 Snow White is not going to marry the Huntsman. First, she’s the queen of the land and he’s an absolute nobody as far as the law is concerned. Second, I just spent a whole lot of ones and zeros telling you why not! All right, let me elaborate. Okay, deep breath. Now, if Eric the Huntsman is the opposite of Finn, Ravenna’s brother, it stands to reason that he and Snow White would share a brother/sister view of each other, wouldn’t it? The Huntsman made it quite clear when he shouted at Ravenna for bringing up his wife that he is not looking to replace her. In the dark forest he cuts Snow White’s skirt off so she can move through the woods more easily (about time! ), and he tells her not to “flatter” herself by thinking he wants anything more to do with her than get her and himself out alive and in one piece. He is chiefly concerned with their survival when he does this less than gentlemanly act. As far as her end of the bargain goes, Snow White seems to have romantic inclinations toward the Duke’s son, her childhood friend, William. It may be that her parents betrothed the two of them; that is never addressed. After all, what other reason would he have for hanging out at the king’s castle as a boy when his father has a nifty castle some, ooh, twenty miles away? Doubtless, Snow White and the Huntsman will keep in touch. After all, he risked his life for her and taught her what she needed to know to defeat Ravenna and end her awful rule. But that’s where it ends. They will care about each other, but not in a romantic way. Well, it’s my take on it; you don’t have to think of it that way. If you think that Snow White does marry the Huntsman at some point after the credits role, that’s fine. Anyway, I’ve got to go. Write you later. Yeah, yeah, the next letter probably won’t be about a movie of your choice. So stop bellyaching and get out of here already! This entry was posted in Movie Reviews and tagged Character Expansion, children's stories, Chris Hemsworth, fairy tales, legends, Movie Reviews, Snow White, Snow White and the Huntsman, The Huntsman, The Story of Snow White on May 5, 2013 by The Mithril Guardian.